Fifteen years after the fall of Soeharto, the age of Reformasi, as it is popularly known, has finally reached the Indonesian literary scene. Not only is a novel published with its complete original content (which was omitted during Soeharto’s New Order regime), but Indonesian readers also have a choice in which literature they read. Many of these “new” novels deal with the tragedy in 1965 when up to one million people were slaughtered, marking Soeharto’s ascent to power. Indeed, literature is now finally taking on the mantle in order to help unravel one of Neues Ordnung’s biggest taboos. Beside the fact that Ahmad Tohari is now able to have his novel Ronggeng Dukuh Paruk (The Dance Girl from Paruk Hamlet) published completely, at least six other novels about the 1965 tragedy have appeared on the shelves in the last five years. Gitanyali (nom de plume of journalist Don Sabdono, a.k.a. Bre Redana) published two novels: Blues Merbabu (in 2011) and 65 (in 2012). Female writers such as Tinuk Yampolksy also had her work, Candik ala 1965, published in 2011, whilst Ayu Utami’s Cerita Cinta Enrico (Enrico’s Love Story) was published in 2012, Laksmi Pamuntjak published Amba (English title: The Question of Red) in 2012. It is in this genre that Leila S. Chudori writes Pulang. It should be noted that Tohari belongs to those senior writers who have based their novels on their own experiences before and during the turbulence of 1965. Another writer is the late Umar Kayam, whose short stories deal with the same subject (both these authors’ works were actually published during Soeharto’s reign, albeit in an incomplete form). Gitanyali, whose parents were communist activists, writes mainly from first hand experience, as does Yampolsky. Ayu Utami and Laksmi Pamuntjak, however, were not born when the bloodbath of 1965 took place, and Chudori was still too young. Each of them writes their novels based on extensive research. The setting of most of these novels is of course Indonesia, be it an unnamed little town on the slope of mount Merbabu in Central Java or on the island of Buru in the eastern part of the archipelago, where Soeharto imprisoned his political opponents from the Indonesian left (and those considered “left”). In this aspect, Chudori’s ‘Pulang’ (literally ‘homecoming’) is an exception. Indonesia appears only at the latter part of her novel, whereas most of it is situated in France — Paris, to be precise. This first novel of Chudori deals mainly with Indonesians who were deprived of any homecoming. Here she unfolds another aspect of Soeharto’s dictatorship, untouched by other novels with the same theme — besides being murderous and repressive, this regime also forced countless Indonesians into exile. Their homeland became a dangerous place to live. When fellow communists or leftist activists were murdered or imprisoned, they were abroad for study or work and thus, had to remain there or risk the same fate of their fellows at home. Their passports were revoked and they became asylum seekers or stateless persons. 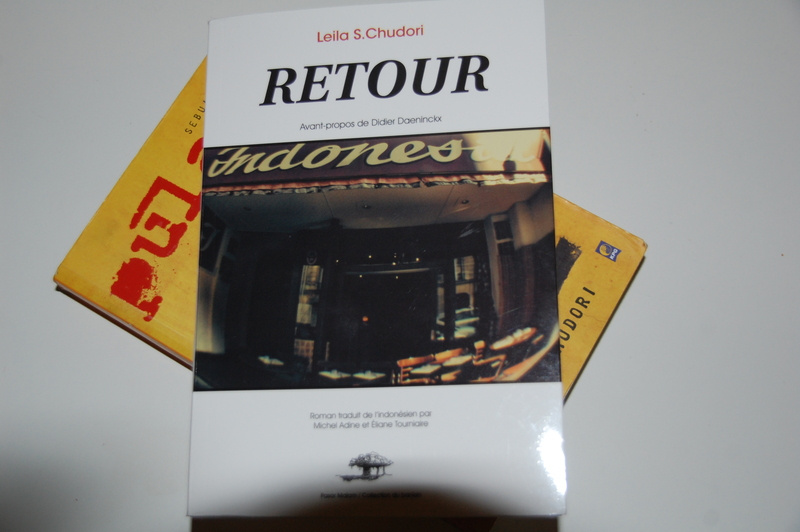 In this novel, Chudori describes meticulously how exiled Indonesians tried to rebuild their lives in Paris. Without any prior experience but getting supports from any corners in the “city of lights”, they set up an Indonesian restaurant. As such, readers are presented not only with their struggle to live in ‘terre d’asile’, but also with the finesse of the Indonesian cuisine. With their bare hands, they are making their own “lights”. It is only in the latter part of the novel that Chudori moves to Jakarta. It is set in May 1998, when the capital city was rocked by demonstrations and the authoritarian regime was in decay and close to extinction. It is here she successfully portrays Indonesia under Soeharto in all its complexities. She also manages, to a certain extent, to highlight the hypocrisy and superficiality of those in power. She reiterated this standpoint when its French translation, Retour, was launched in Paris in October 2014. She will not let her book just be another New Order’s mouthpiece. Well, who would? Addressing the issue of New Order’s version of history, we could ask the novelist why s/he creates no character that promotes that version? To be fair Chudori’s novel contains such characters but they are in such minor roles that their presence in the novel is virtually meaningless. They are not fully-fledged characters. There is the leftist writer called Sumarno Biantoro who, after enduring severe torture, betrays his fellow artists and reports their names to the military authorities. There is also a family with unquestionable loyalty to Soeharto, only to discover that one of the children is having a serious romantic relationship with a daughter of a former political prisoner. One would love to read about the confrontation and how this family survives such an ordeal, but these characters are in such a peripheral position that if one omits them the novel would still stand firm. It is interesting that Chudori also makes use of Mahabharata as a reference for her characters. Her description of Ekalaya is such fine storytelling that one can easily become absorbed with the beautiful writing and forget the basic principle of this great Indian epic. Mahabharata is an epic consisting of two poles: the good represented by the Pandava and the evil represented by the Kourava. Fully developed characters represent both sides and this is what one misses in Chudori’s novel. Her skilful description of Ekalaya includes no explanation on which side this character belongs. The story of Wayang (the Javanese adaptation of Indian epics), can be tricky if one forgets the bigger picture. In other words, her reference to Mahabharata would have been more meaningful if she had also created both poles of characters, as in the Mahabharata. While Chudori is expecting the English and Dutch translation of her novel, post-Soeharto Indonesian literature still has a lot of catching up to do, not only in terms of skilful, dignified writing but also in unravelling the taboos. The East Timor debacle is perhaps the next one.